Last week, Pew’s Elections team launched a series of state snapshots of 2012 election data, offering a state’s-eye view of last year’s election. 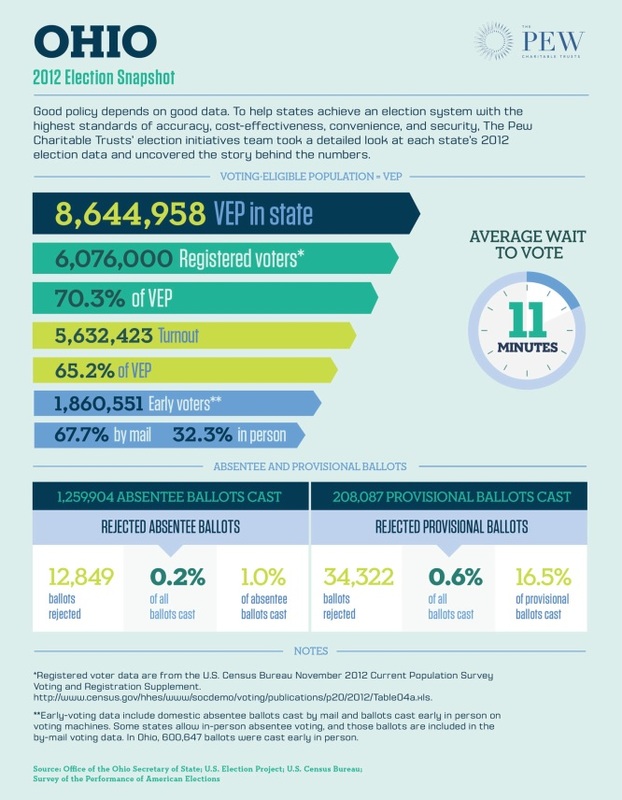 In the 2012 presidential election, approximately one-third of the more than 5.6 million ballots cast in Ohio were cast before Election Day, surpassing early vote totals for 2008, when almost 30 percent of ballots were cast early. The increase was due in part to absentee ballot applications being sent to all registered voters, a first for the state. Additionally, even with more absentee ballots cast than in 2008, fewer were rejected: Approximately 13,000 were not counted in 2012, compared with almost 26,000 rejected in 2008. Thanks to the Pew team for these snapshots – and I look forward to seeing more in the coming weeks and months! Be the first to comment on "New Pew Snapshots Provide State-Level Look at 2012 Election Data"